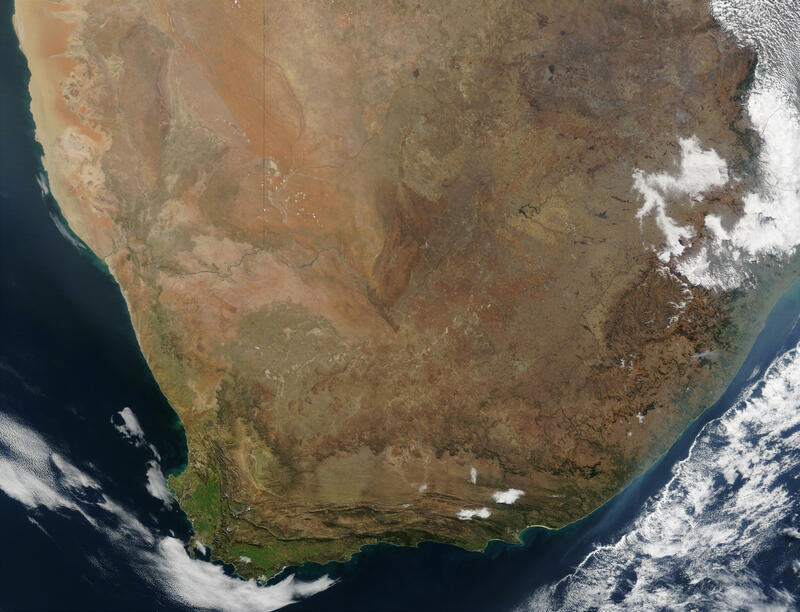 The whole of the Republic of South Africa is visible in this true-color Terra MODIS image acquired August 8, 2002. Also visible are the countries of Lesotho (middle right) and Swaziland (middle right edge). Namibia occupies the top left corner of the image, while Botswana occupies the middle top edge. A number of fires were detected by MODIS, depicted here as red dots. Smoke plumes are more visible in the higher resolutions, as is evidence of croplands and large cities, such as Johannesburg, site of the recent Johannesburg Summit, the sequel to the 1992 Earth Summit in Rio de Janeiro. Johannesburg is directly north of Lesotho and directly east of Swaziland. Very near Johannesburg is the city of Pretoria, South Africa’s capital.